A HORRIFYING EXPERIENCE. On July 13, game developer Red Meat Games released its fifth virtual reality (VR) project, Bring to Light. It was particularly appropriate to release it on Friday the 13th, since the developers designed the VR horror game to quite literally push players to their terror limits with the help of a biometric sensor. PUMP UP THE TERROR. 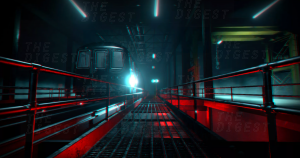 In Bring to Light, a player must navigate a creepy abandoned subway tunnel as the sole survivor in a crash. In addition to wearing VR goggles, they also have the option to wear a heart rate monitor. This monitor relays the data to a custom AI that adjusts the gameplay depending on the player’s heart rate. The player will need to buy the monitor on their own — the VR horror game doesn’t come with one. For now, they can choose between two options: the Scosche Rhythm and the Polar H10. Bring to Light is now available for purchase on the gaming platform Steam for $20 and is playable on Oculus Rift, HTC Vive, or PC (without a VR headset).